Background: Lymphedema is a medical condition that is an externalization of a lymphatic insufficiency. The aim of this study was to assess the effect of intensive lymphedema treatment on the body mass and fat mass Indexes. Method and Results: A clinical trial was performed using bio impedance to evaluate changes in the body mass and fat mass Indexes of 30 consecutive patients submitted to intensive lymphedema treatment of the legs (8 hours/day for one week) in the Clínica Godoy between 2013 and 2015. The paired t-test and Fisher’s exact test were used for statistical analysis with an alpha error of 5% being considered acceptable. Significant changes in the mean body mass (p-value = 0.0001) index was identified by comparing evaluations before and after treatment however there was no significant improvement in the fat mass index. In these cases, morbid obesity was associated with age over 40 years (Fisher’s exact test: p-value 0.01). Conclusion: A significant reduction of edema during the intensive treatment of stage III lymphedema can reflect in a significant reduction in the body mass index. Recently, international publications have described a new concept of intensive outpatient treatment for patients with lymphedema with the possibility of reducing around 50% of the volume of the lymphedema with five days of treatment. [6,7] This technique is a clinical approach that associates manual lymph drainage (Manual Lymphatic Therapy), an inelastic compression stocking (individually made using a fabric called grosgrain),  cervical stimulation and mechanical lymph drainage using the RAGodoy® electromechanical device. Thus, major changes in volume are generally observed in a short period. The aim of this study was to assess the effect of intensive lymphedema treatment on the BMI and fat mass Index. A clinical trial was performed using bio impedance to evaluate changes the in BMI and fat mass index of 30 consecutive male and female with diagnosis for lymphedema, secondary and primary and that was submitted to intensive treatment of the legs (8 hours/day for five days) in the Clinica Godoy between 2013 and 2015. All participants had grade III unilateral or bilateral Lymphedema of the legs. Patients with active infections at the beginning of or during treatment, joint immobility or heart disease were excluded from this study. Patients were enrolled in the study consecutively in order of arrival in the clinic. They were submitted to intensive treatment consisting of 8 hours/day using Mechanical Lymphatic Therapy (RAGodoy®), 15 minutes of cervical stimulation and a grosgrain stocking (24 hours/ day). Mechanical Lymphatic Therapy consists of passive flexion and extension movements of the ankles specifically for the treatment of lymphedema. Cervical stimulation consists of gentle stroking movements using the thumb in the supraclavicular region at the base of the neck. Patients were assessed by bioimpedance (Inbody S10) before and after five days of treatment. The paired t-test and Fisher’s exact test were used for statistical analysis with an alpha error of 5% being considered acceptable. The study was approved by the Research Ethics Committee of the Medical School in São José do Rio Preto (FAMERP)-Brazil # 099065/2015. The mean age of the patients was 45.8 years (standard deviation: 14.6; range: 21-73 years). Table 1 shows the ages, and changes in body fat mass and BMI of patients before and after treatment. A significant variation in the mean BMI (p-value = 0.0001) was observed. Eight patients had numerical increases and 22 had reductions in body fat mass, but there was no statistical significance (p-value = 0.5431) in the mean change in body fat mass. 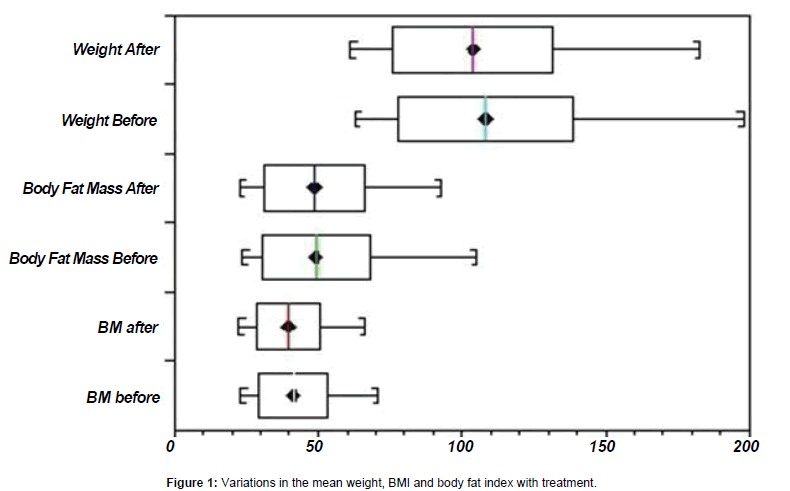 Figure 1 shows the variations in the mean weight, BMI and body fat index with treatment. Ages greater than 40 years were associated with obesity in this group of patients (Fisher’s exact test: p-value 0.01). Figure 1: Variations in the mean weight, BMI and body fat index with treatment. Table 1: Age and variations in weight, body mass index and body fat mass of the patients. This study shows that the reduction of edema in intensive lymphedema treatment reduces the weight and BMI, but does not significantly change the fat mass index. There are no descriptive studies in the international literature that report on this aspect of lymphedema treatment. It is noteworthy that the BMI is an index calculated from the weight and the height of subjects that is used in the literature to correlate with parameters of obesity. Individuals are considered underweight when their BMI is below 20; an ideal weight is between 20 and 25, overweight when the BMI is between 25 and 30 and obese is above 30. Obese individuals are subdivided as mildly obese (BMI between 30 and 35), moderately obese (BMI between 35 and 40), morbidly obese (BMI between 40 and 50) and very severely obese (BMI above 50). The classification of some patients in this study improved; three patients with morbid obesity before treatment became moderately obese, three who were moderately obesity became mildly obese and another mildly obese case became overweight. As the lymphedema was not fully reduced in one week of treatment, it is expected that the reduction in weight and BMI is greater with the normalization of edema. This study showed that there was a reduction in the BMI and the classification of obesity in some cases, but these patients did not lose fat because they did not reduce their caloric intake. They lost water and therefore weight, with a decrease in the BMI. Lymphedema is the accumulation of water and macromolecules in the interstitial space, different to obesity, which is an accumulation of fat. Research by the same author’s shows that the intensive treatment of lymphedema causes significant weight loss and a reduction of fluids in the lymph edematous limb, but an increase in liquid in non-affected extremities and the chest. [6,7] This suggests that the macromolecules are redistributed with the relocation of fluids during treatment and not eliminated. In treating obesity, the weight of all the extremities and the thorax is reduced, different to the weight loss during lymphedema treatment. A reduction in the classification of obesity by BMI was seen in seven patients, but what is important in this group of patients is that 15 of the 30 patients were morbidly obese. Only one patient had a normal weight and three were overweight. Another detail is that ages greater than 40 are associated with morbid obesity. Two of 11 patients aged less than 40 years and 13 of 19 patients aged over 40 years had morbid obesity. Thus, age is associated with more severe obesity in lymphedema. Research shows that obesity is a risk factor for developing lymphedema as well as a poor prognostic factor regarding the treatment of lymphedema. There was no significant change in the mean fat mass index of this group of patients; in this assessment, there were numeric increases in eight patients and decreases in 22. Significant reductions in the edema during the treatment of stage III lymphedema can lead to significant decreases in the weight and BMI, but no significant change in the fat mass index. Lee BB, Andrade M, Antignani PL, Boccardo F. Diagnosis and treatment of primary lymphedema. Consensus document of the International Union of Phlebology (IUP)-2013. Int Angiol. 2013;32:541-574. Pfarr KM, Debrah AY, Specht S, Hoerauf A. Filariasis and lymphoedema. Parasite Immunol. 2009;31:664-672. Ridner SH, Dietrich MS, Stewart BR, Armer JM. Body mass index and breast cancer treatment-related lymphedema. Support Care Cancer. 2011;19:853-857. Dylke ES, Alsobayel H, Ward LC, Liu M, Webb E, Kilbreath SL. Use of impedance ratios to assess hand swelling in lymphoedema. Phlebology. 2014;29:83-89. Jammallo LS, Miller CL, Singer M, Horick NK, Skolny MN, Specht MC, et al. Impact of body mass index and weight fluctuation on lymphedema risk in patients treated for breast cancer. Breast Cancer Res Treat. 2013;142:59-67. Pereira de Godoy JM, GonÃ§alves IP, Barufi S, Godoy Mde F. Large reduction in volume with the intensive treatment of lymphedema: Reduction of fluids? Int J Angiol. 2012;21:171-174. Pereira De Godoy JM, Franco Brigidio PA, Salles Cunha SX, BatigÃ¡lia F, De Fatima Guerreiro Godoy M. Mobilization of fluids in large volumetric reductions during intensive treatment of leg lymphedema. Int Angiol. 2013;32:479-482. De Godoy JM, Pinto RL, De Godoy LM, Godoy MD. Pilot study on the association of different compression mechanisms to maintain the results of lymphedema treatment over one year. 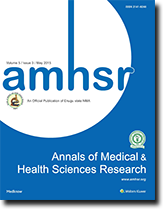 Ann Med Health Sci Res. 2017;7:365-367.